There comes a point where a guy can't keep being strong. “Are you crying?” This question was very unnecessary since there were tears streaming down the boy’s cheeks and his breaths were interrupted by little hiccups you get from breaking into tears. “No, I’m definitely not crying. I’m just huddled in a corner while my eyes are watering and I’m questioning my life. That’s all.” Truth be told, the boy’s life could have been worse. He hadn’t been able to walk for a little less than a year, he was about to be kicked out of his school’s accelerated program, his heart had been shattered, but his life could have been worse. That fact didn’t matter to him though. He was done of being tough and not letting the world see what he was really feeling. “Dude, come on. 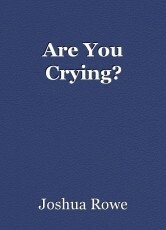 You have to stop crying. People are going to talk and you’ll be ridiculed.” His friend should have thought before he talked, because that statement made the boy clock his friend in the jaw. “If you say so. I’ll be close by if you need me.” The boy saw his friend walk to the door, leave, and shut the door behind him. He was grateful for the closed door and hoped it’d work to eliminate some of the sound coming from the room. Then the boy opened his mouth and screamed. He screamed for a solid two minutes. He painted a mosaic of obscenities, questions to a higher power, and screams of just pure emotion. He screamed until he had no breath in his lungs and until he got light headed, then he fell to his knees, and passed out. In his dreams, he was greeted by two figures: Love and Hate. Each beckoned to him, but Hate spoke first. “Child, just accept that there is no love in this world. It’s a cruel place and you know it. I’m everywhere in this world, and all you need to do is look around.” Hate grabbed the boys hand and the boy’s head was filled with visions of the worst in people and their actions; people slaughtered over religious disputes, people being denied because of a predisposition they had no part in, a child shoved onto the streets by parents who didn’t want their spawn to be homosexual because they thought it was unnatural, and people setting fires and rioting because they are afraid for their future and all they see in their leader is hate and cowardice. Love came to the boy and pulled Hate’s hand off of the boy. “Hate is wrong. I am still everywhere in the world and so is Hope.” Love gestured behind him and the boy saw a little girl, no older than six. She had a smile on her face and eyes that could brighten up the cloudiest day. “Let me show you.” Rather than forcefully take the boy, Love simply offered out his hand and waited for the boy to take it. The boy hesitated for a moment, then Hope smiled at him and spoke to him, almost whispering, “Go ahead, I know you believe there is still good in this world.” So the boy took Love’s hand. The boy saw visions again, but these were very different from those he saw from Hate; he saw a bystander help a woman whose grocery bags had ripped and the contents had spread out across the sidewalk, he saw normal everyday people running into a burning building to save those still inside because the firefighters hadn’t arrived yet, he saw an abandoned child being taken in by another family even though they barely had enough by themselves, he saw Christians in the Middle East protecting Muslims who were trying to pray while people were attacking them, he saw a stranger talking someone off the edge of a bridge even though the two had never met, he saw families who were divided between opposing countries finally reuniting and embracing each other, and he saw the good that all people have inside them. “This is what love is and this is how love exists in the world. Hate can only exist of you let it, and it can’t control you if you don’t allow it to.” Hate scoffed at this statement. Love rolled his eyes looked to the boy. “What you do with what you’ve seen is up to you. I think it’s time for you to wake up, but do not forget what you’ve seen,” Love said as he bode farewell, and the boy was sent back to reality. When he woke up, he was surrounded by his friends who had all come to make sure he was okay. He heard a chorus of “He’s awake,” and ,”Are you okay?” and saw how relieved everyone was to see that he was alright. “Yes, I’m fine, great actually. I got over what was bothering me. Thank you.” When the boy finally stood, he felt a thousand pounds lighter. He was able to stand tall and proud because he was not going to let Hate and negativity govern his life. The boy made an internal promise: he swore that he would always spread love in this world, because too many people are spreading nothing but hate. © Copyright 2019 Joshua Rowe. All rights reserved.